Home / Star-Wars-VI-Return-of-the-Jedi / StarWars / Video / RETURN OF THE JEDI Behind-the-Scenes Video Shows Rancor Monster...as a Man in a Suit? RETURN OF THE JEDI Behind-the-Scenes Video Shows Rancor Monster...as a Man in a Suit? Would the Rancor monster have been as scary as a man in a suit? These days, with CGI we take special effects for granted. Back when they made movies in the 80s it was a lot harder to get the effects they were looking for. 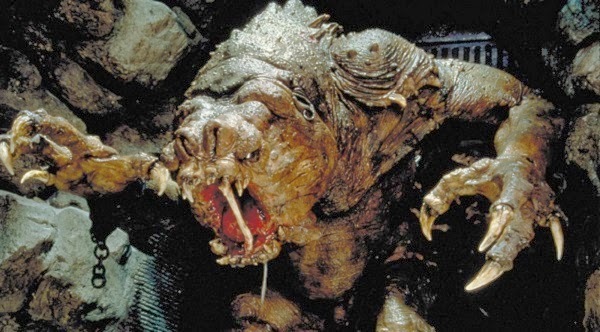 Last week StarWars.com uploaded an interview with Dennis Muren of George Lucas' special effects company "Industrial Light & Magic" (ILM) talking about creating the hideous rancor creature from Return of the Jedi. Muren did an interview with the Star Wars Blog getting into more detail of the journey from suit to "muppet." "We tried that originally with a guy in a suit," said Dennis Muren, "George thought that might work, and Phil and I were thinking, 'This will never work.' But as we got into it, we made a suit that a couple of guys could work with. It was one creature but really being controlled by two people inside of it. It was as big as a person actually is, so it was not a rod-puppet or anything. And it started looking pretty neat, but George pretty quickly said, 'No, this is not going to make it.' And we were pretty exhausted, especially me, and I’m sure Phil was, too, from doing go-motion. We didn’t want to go into it for that, and I was always pushing for something different to get rid of the chatter for stop-motion. I think Phil came up with the idea of doing it with a rod-puppet. And that was kind of good. We could hide the rods in the darkness and set the shots up to look like the creature was big. "To get the performance out of it, we did all sorts of… Right away you’ve got Phil or someone’s arm up in this creature. Right away it looks like it’s a muppet or a hand puppet. Even when you’re a kid and you stick a sock puppet on your hand, you know what that looks like. It’s embedded in your mind, and this looked like that. We saw that, and we did everything we could in every shot to have it not look like that. Shooting high speed, shooting slow speed, or shooting things backwards, because bodily, your muscles work differently. The film has got a lot of those shots in it, and most of it we tried to do without doing any matting, because I was not a big fan of matting in those shots. So we did them actually in the camera, except for a couple of shots in there. And we could control the light and the haze and everything on it. And that was kinda good. It was not really a big sequence. It was a tiny little set with five people jammed into it." When asked if it would have been easier to use stop-motion Dennis Muren said, "You know, stop-motion probably would have been actually the easiest. It’s time consuming, but you kind of know what you’re going to get. It’s harder for the animator, and that’s not me, but I think the results came out a lot better with what we ended up doing with rancor." "I mean, every time I see it, and I haven’t seen it that much, I feel very limited in what it could do. I want to be back looking at it more, and I want to see it just doing something, and it doesn’t. And it’s because it can’t. With that technology, that’s the most it could do. And that’s all it really needed to do, anyway." Read more about Dennis Muren work on Return of the Jedi at the Star Wars blog. What do you think of the video? Would the rancor have worked as a dude in a suit? Which is your favorite creature from Return of the Jedi? Interesting they tried several things before settling on the small puppet. I've heard miniatures are still cheaper than CGI, but no one wants to use them anymore. I guess it could have looked like a Godzilla suit. Wow. I am very impressed with what was possible using practical FX. I still am sometimes. I saw the youtube clip about the raptors in Jurassic Park being guys in suits and I still freak out about it. I'd be interested to see how far they could push it now if they really tried. seeing this video you cannot help but compare it to more "modern" installments of star wars monsters; jar-jar for instance. it goes to show that new isnt always better. i have always though that puppets age better than any cgi, making them (at least for now) far superior to their digital counterparts. more puppets! Next you will tell me it took several people to play Jabba. I'm not buying it anymore, Geek Twins. You won't fool me again. Star Wars was real!!! when making a movie meant, making a movie... not just, digital. Game is a very interesting and great entertainment for our daily life . It refresh our mind. Playstation 5 game helpful for keep easy mind . This is a helpful website for the game, here you find many kind of games and get good knoeledge about ps5 games. German: Spiel ist eine sehr interessante und gute Unterhaltung für unser tägliches Leben. Es aktualisieren unsere mind.Playstation 5 Spiel hilfreich halten einfach Sinn. Dies ist eine hilfreiche Website für das Spiel, hier finden Sie viele Arten von Spielen und gute knoeledge PS5 Spiele.